This innovative world music / jazz group features original works performed by four of the most gifted contemporary instrumentalists. 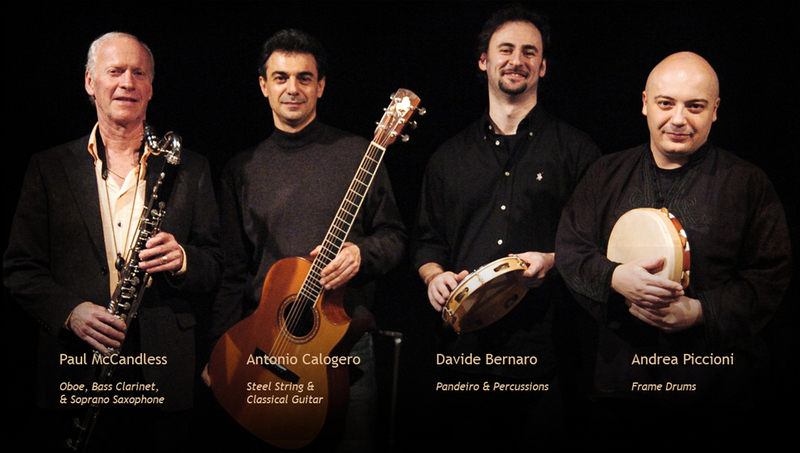 Italian guitar master Antonio Calogero, hailed by the Los Angeles Times as an "evocative sound painter" teams up with Grammy Award Winner Paul McCandless (multi-instumentalist and composer from the legendary group Oregon), frame drum extraordinaire Andrea Piccioni, and the eclectic percussionist Davide Bernaro. The Antonio Calogero Ensemble performs music that embodies the spirit of the Mediterranean, yet transcends all music boundaries. Italy's Antonio Calogero is a bright light in the new generation of acoustic guitarist/composers. Drawing on folk, jazz, classical and world music influences, his passionate original style combines highly articulate melodies with unique chord changes. Although he composes for both nylon and steel-string guitar, Antonio's rigorous classical guitar training imbues his performances with insight and precision. After performing for 15 years in Europe, he has been winning recognition and praise in the US since 1995 as a solo artist, regularly featured guitarist on the International Guitar Night tours and leader of the Antonio Calogero Ensemble featuring Grammy Nominee Paul McCandless (multi-instrumentalist and composer from the legendary group Oregon), fretless extraordinaire Michael Manring and the eclectic percussionist Brian Rice. 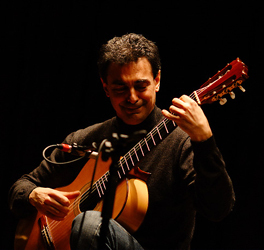 Antonio has two solo guitar cds to his credit (Caleidoscopio on DDD records and La Rosa del Deserto on Acoustic Music Records), and his new recording for guitar & ensemble Danza Multietnica, co-produced by Alex de Grassi, was released on Suono Records in June 2009. Paul McCandless, a pioneer of modern instrumental music, has brought a soaring lyricism to playing and composing that has been integral to the sound of two seminal world music bands; the original Paul Winter Consort, and the relentlessly innovative quartet, Oregon. A gifted multi-instrumentalist, McCandless specializes in an unusually broad palette of both single and double reed instruments, performing and composing in a style that reflects his grounding in both classical and jazz disciplines. 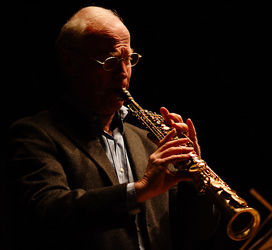 His array of woodwinds includes oboe and english horn, bass clarinet, soprano and sopranino saxophones, penny whistles, various ethnic flutes, and the electronic wind controller. He has also worked as a solo artist, and is credited with more than 150 albums and performances with such musicians as Jaco Pastorius, Carla Bley, Art Lande, Eberhard Weber, as well as with Wynton Marsalis, Pat Metheny, Steve Reich, Al Jarreau, Bela Fleck and Andy Summers. Andrea Piccioni, regarded as one of the leading figures in the world of frame drums, specializes in a variety of percussion instruments of the Mediterranean Area. His main instrument is the "Tamburello" on which he shows extraordinary skills and artistic sensibility. Through his studies with Italian, Persian, Turkish, Indian and American Masters he has developed his own personal style as long as a great ability of performing in a wide range of musical genres. 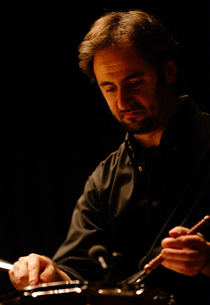 He is the founder of the first "INTERNATIONAL FRAME DRUMS MEETING" and has collaborated with many international groups and soloists including: Milagro Acustico, Nidi D'Arac, Musicanti del Piccolo Borgo, Tamburo Mundi, Unavantaluna, Indaco, Gabriele Cohen, Giovanni Palombo, Ensemble Enchiriadis, Freiburger Spielleyt, Les Haulz et les Bas, Orlando di Lasso Ensemble, Lucilla Galeazzi, Ganesh Kumar, Glen Velez & Lori Cotler. Besides an intense concert activity, Andrea holds regular workshops and master classes throughout Europe, Middle East, USA and South America. 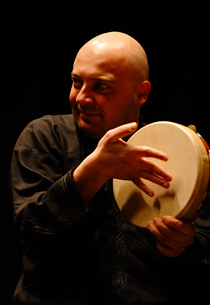 Davide Bernaro, is a specialist of Afro-Cuban and Afro-Brazilian percussion instruments. He has attended master classes and workshops in Italy, Germany and Brazil with Paolo Caruso, Dudu Tucci, Trilok Gurtu, Marcos Suzano, Roberto Evangelisti, Sergio Krakowsky and Irian Lopez Rodriguez. He is a member of several world music groups including: Nelson Machado (guitarist and composer from Sao Paulo), Silvio Zalambani e Grupo Candombe (Instrumental Latin-American Music) and Banda Jacaré (World Music). He has collaborated among others with funky/soul group Natural Club, brazilian singer Denise Dantas, lounge music group Estrela Guia, Academia de Capoeira Coquinho Baiano, brazilian singer-songwriter Rogerio Tavares, pagode band Republica da Alegria, salsa band Axé Babà/Clave de sol, comedian Bob Messini (Trio Reno), Escola de Samba Berimbau, Academia do Ritmo Afroeira, saxophonist Alessandro Scala (Sam Paglia, Alessandro Scala Jazz Quintet) and Ochtopus Ensemble.